This is Greenhouse Seeds' tribute to the marijuana activist Jack Herer. They took a Haze and crossed it with Red Skunk, resulting in a very potent and high yielding variety. With Jack Herer weed you can effectively reduce pain and stimulate appetite. 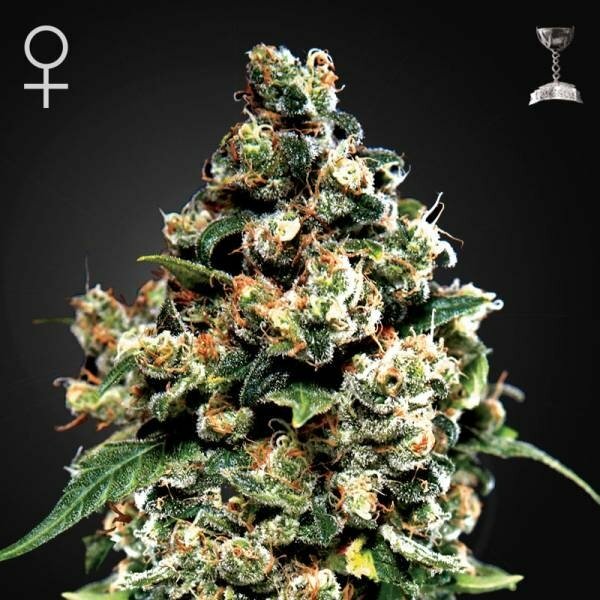 Jack Herer yields up to 800g/m² after 8 weeks and boasts with a THC level of 20%. Strong cerebral and physical effect. This tribute to the marijuana activist Jack Herer by Greenhouse Seeds is the crossing of a Haze and Red Skunk. The result is a high yielding and very potent variety with high medical value. This weed is a great remedy for patients suffering from pain and lack of appetite, but also gets you high in a very pleasant way and for a long timespan. This awesome hybrid has won so many awards that we probably missed more than one in our list! Jack Herer responds very good to the SOG and ScrOG method and has the potential to yield in the range of 700-800g/m². When brought up outdoors you will be amazed at the incredible productivity - under perfect conditions you will be able to harvest 1.2kg per plant by the end of September. The buds of Jack Herer look like giant clusters of green popcorn flakes riddled with countless orange pistils and rolled in powdered sugar. And not only the amount and look of the weed is a reason to brag about, the buds are highly resinous and filled to the brim with power - 20% of the harvest are THC, so you better savor this stuff while seated! Bin EXTREME enttäuscht 0 von 5 Samen gekeimt... Greenhouse nie wieder!!!! 5/5 niveau germination, par la suite 2 plantes ont pris du retard en terme de croissance. Rien de bien méchant. elle seront juste un peu plus petite. Slechte zaad gekregen.waren nog voort zegge groen.van 3 geen uitgekome. Juist hetzelfde met kalashnikova van GH. I have tried a lot of stuff. But this specific greenhouse jack had so bad genetic. That from 5 , 2 buddies couldn't switch from grow to flower till the end of run. Deformed, asparagus not even one hair came out..... Dissapointed. Im only one unlucky with these or not. But not ordering again specific these ones :( . Good luck for others.